I just wanted to start this post by saying this is not a leisurely read. I wanted to write this down for myself and for any of my friends who may be using Funshine or thinking about using Funshine for their children. Funshine Express has an amazing Fireflies program for preschoolers. It comes with a great curriculum guide and almost all the supplies you need to do the crafts and activities. I believe the original design of the Fireflies program is to use it in a preschool/daycare. So it is designed with curriculum for 5 full days a week. We don't need quite that much activity so I have been breaking it up. My goal was to use the one year of curriculum for 2 years of school at home. Since the typical 3 year old preschool is 2 days a week and a 4 year old preschool is 3 days a week that is how I decided to set my goal. I would focus on completing 2 full days of their curriculum each week. It took quite a while to work through the first month of September in this fashion which was fine at the time because the fall themed activities were still done in the fall. However, when I got to October's curriculum in December it didn't quite match up to have Fall activities in the Winter. So I began to think of a new way to break it up. The reason I didn't want to initially just do Tuesday and Thursday lessons this year and the Monday, Wednesday, Friday lessons next year was because I missed out on some important introductions to the letters, numbers, colors and shapes. 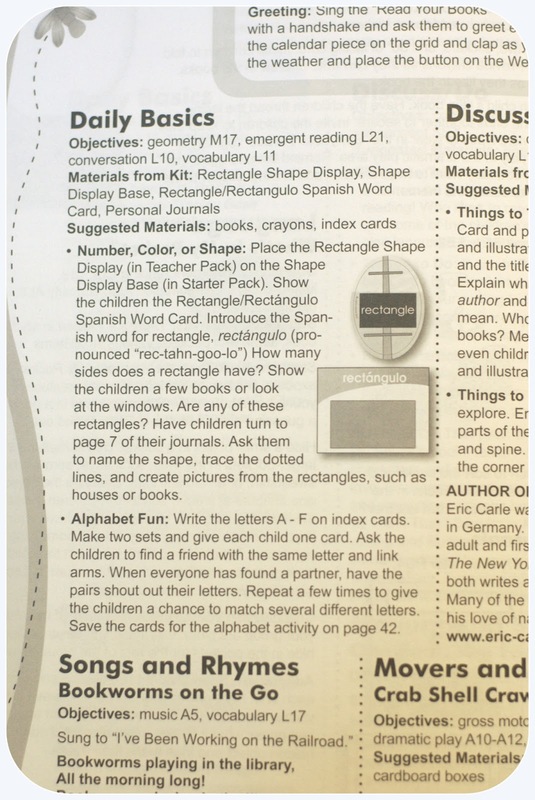 As I further investigated the curriculum I discovered that most of the introductions of these important topics were in the Daily Basics section that is on each day of the week. This is when I came up with my new plan. This is an example of the daily basics section. This year, for 3 year old preschool, I am still focusing on completing the Tuesday and Thursday lessons each week. But I have also added the daily basics to my list of things to do each week. This is what my weeks schedule looks like: Monday I start with the daily basics listed on that day and then start on some of the lessons listed on the Tuesday curriculum. On Tuesday I start with the daily basics listed on Tuesday and then do some more of the activities from Tuesday's curriculum. Wednesday I do the daily basics from Wednesday and move on to Thursdays lessons if Tuesdays are completed. This is of course an ideal week. There are days we do very little for school due to illness or busy schedule. Then there are days we do a lot of school work. But the basic order of how I work through the curriculum guide is the same. There are some games and crafts that are not used at all this year but I have them filed away for next year. That makes complete sense. I think I'm going to just pull out units I like and then follow along with the basic like you said. This way I can use some other preschool unit ideas or tie things into stuff we might be doing (transportation week when we ride a train or plane, animal week when we go to the zoo). I asked my four year old if she likes set school time or just doing it whenever. She said whenever we want so I'm going to have things ready to go for when she wants. Again great recap, thanks!